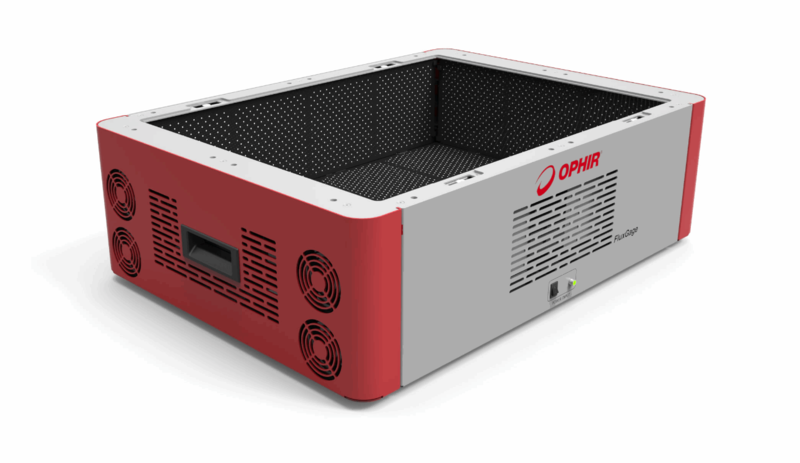 North Logan, UT – Ophir Photonics Group, a Newport Corporation company celebrating 40 years of excellence as the global leader in precision laser and LED measurement equipment, has announced the FluxGage, a compact, all-in-one LED luminaire measurement system. The patent-pending FluxGage measures flux, color, and flicker, important quantities for evaluating the performance of LED-based products. The measurement system is three times smaller and lower cost than equivalent integrating sphere products. It is designed for use by R&D during development and production for incoming inspection and quality control of new and replacement parts, allowing LED luminaires and modules to be sorted for consistency. The FluxGage is an all-in-one photometric test system that uses 2π (two pi) geometry. A spectrometer is incorporated for color measurement of the spectrum, CCT (correlated color temperature), CRI (color rendering index), Duv, and chromaticity. There is also a fast photodetector for flicker measurements. No fibers are needed. The FluxGage system uses solar panels as the light detector. The panels are arranged on the inside walls of the measurement cavity and are covered with black paint and a dense array of clear pinholes through which the light passes. This design significantly reduces the reflectance of the solar panels, enabling the system to be only slightly larger than the luminaire source under test. It can measure luminaires of up to 610 x 450mm. Integrated software simplifies set up and operation with all the optical data from the light source displayed. The FluxGageconnects to a PC via a USB cable. A calibrated, NIST-traceable LED source is used to calibrate the system in the field. The FluxGage LED luminaire measurement system is available now. OEM pricing is provided on request.